We’ve relaunched our t-shirt campaign on Bonfire, keeping our most popular colors and adding some new ones. If you didn’t get a chance to order previously, or if you need one for a gift, or want one in a second color, here’s your chance! Keep in mind that these shirts will ship in May, so they will NOT be available for you to wear at the event on April 22nd. NOTE: These shirts run small, so check the size chart and order up a size. 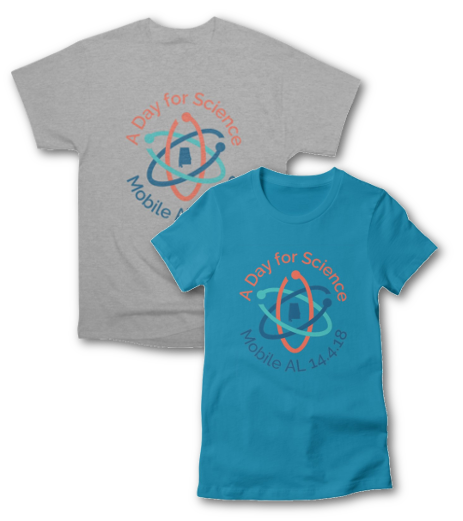 All funds raised from the sales of these shirts go to defray costs of the march, and if there is anything extra, it will be used to purchase science supplies for local schools. We thank you for supporting March for Science in Mobile!